KEF's Award-winning Muo gets a new chrome finish | What Hi-Fi? The Muo goes shiny with its new premium finish, which will be available exclusively in Harrods later this month. How do you improve on an Award-winner? While we might suggest engineering tweaks or a price drop, KEF has a different idea: add a premium finish. The British company’s Muo portable wireless speaker, which picked up a What Hi-Fi? Award in 2015 (but couldn't hold its title last year thanks to the Dali Katch's arrival) will soon be available in a new reflective chrome finish. 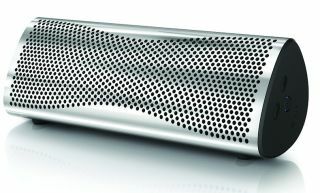 The appropriately named KEF Muo Metal, which will arrive exclusively at Harrods later this month priced at £350, marks the latest collaboration between KEF and industrial designer Ross Lovegrove. Lovegrove also sculpted the British speaker company’s £140,000-per-pair flagship Muon, of which the Muo is a rather more modest descendent. The innards remain unchanged over the original Muo - there are still dual 5cm drivers, a bass radiator and an internal sensor claiming to optimise the sound based on its orientation - so we’d expect it to possess a “clear, detailed and musical” performance. No, the Muo’s new frock alone won’t be enough to ruffle the feathers of the aforementioned Dali - especially considering it attracts a rather hefty £100 premium over the existing gold, grey, silver, neptune, pink or orange finishes. But we have to admit it does look very nice indeed.